I have seen recent information linking safety concerns of plant managers to contamination sources from outside the production environment -- specifically related to HVAC and processing equipment and how these items contaminate the roofing environment. Can you tell me how the majority of plant managers view this threat to food safety and what they are doing to mitigate this threat? Heating, ventilation and air conditioning (HVAC) systems have proven to be a source of contamination with pathogenic microorganisms (Listeria). As a result, many plant managers today are taking steps to ensure that their HVAC systems can be adequately cleaned. The primary object is to have an HVAC system that is designed, installed, cleaned and maintained so it cannot be a source of contamination. Recognizing that this objective is easier to achieve when dealing with new construction or major facility renovation, many of these plant managers are turning to their hazards analysis and critical control points (HACCP) plans to control the risk level for existing systems that were not designed with cleanability in mind. Viewing the openings into the roof for air handling exhaust fans, ventilation ducts and plumbing vent pipes as potential critical control points for foodborne hazards requires regular monitoring and verification steps to document that these areas are properly sealed and appropriately flashed and screened. Proper attention also must be paid to frequently changing filters and monitoring and verifying that the air supply is not being drawn from nearby sources of contamination related to the outside environment. Monitoring and verifying the proper use of cleaning materials can assist in eliminating the use of corrosive chemicals when cleaning these older systems. Since many of our older food facilities were not designed and constructed with current sanitary design standards in mind, food operational management needs to focus first on ensuring that these facilities are not a source of contamination. 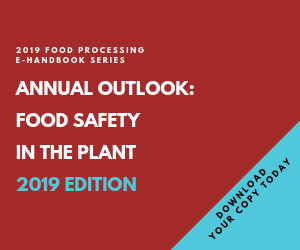 By including our facilities in our HACCP definition, we can evaluate the overall facility as a potential contamination issue that affects the safety of the food product, and we can justify adjustments and/or capital improvements as necessary.